An affidavit of paternity or a paternity affidavit form is a document which is to be used and signed by an individual for him to legally establish paternity to a child. 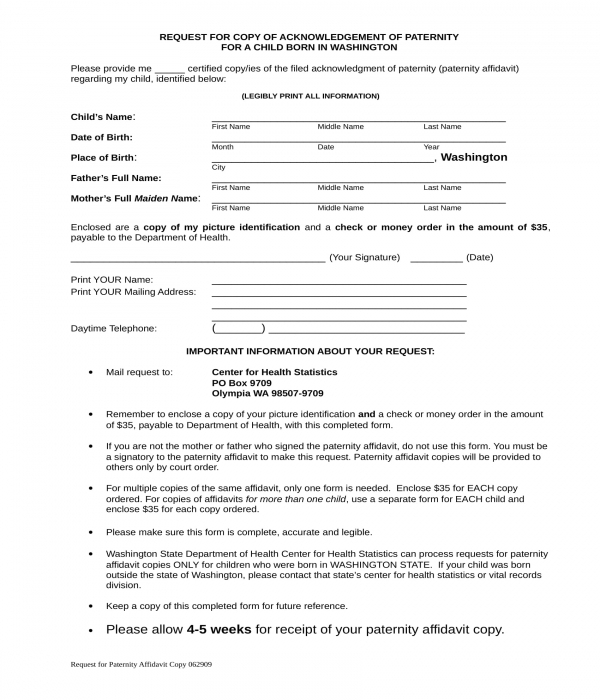 The form is often supplied by hospitals or medical institutions hours after a childbirth as well as by organizations to ensure that an individual is legally using the surname or the records of his claimed father. Affidavit in Support of Establishing Paternity Form – This is a type of affidavit of support form which centers on establishing the paternal rights of the affiant or the claimant. The purpose of the form is to document the claims of the affiant and to summarize the pieces of evidence or data which can be used for proving the paternal relationship of the affiant and the other involved parties. In the form, the heading or the header section will gather the name of the affiant or the petitioner and the respondent along with their social security numbers. The affidavit’s type of case will be stated in the caption portion of the form with the code assigned for the document and even the docket number depending on what the court or the State requires from the affiant. In the event that there is more than one claimant or children who will be claiming their paternal relationship to an individual then there must be two separate affidavit forms to be used and submitted. The separated documents will each be evaluated and assessed by the court along with the medical authorities to further determine the relationships of the involved parties. The first main section of the form is allotted for the name of the affiant along with his role in the case of whether he is a parent of the child or not. The child who is in question or the subject of the paternal relationship will be identified in the form. The details of the child which includes his full legal name, date and place of birth, the date when the child’s mother got pregnant, whether the child was born under a full term pregnancy or was premature, the full maiden name of the mother, and the country or address where the mother got her pregnancy. The name of the person whom the child was conceived with will also need to be stated along with a few clarifications regarding the child’s birth certificate form records. The second section of the form is only limited to be fulfilled by the mother of the child in question. The mother should be able to supply more information about the claim and the child. Such details include whether or not she was sexually involved with another man during the time the child was conceived. The names of the men whom she got into a relationship or got involved with are to be enlisted in the form as well as indications of whether or not they are biologically related to the affiant or the paternal claimant of the child. The reason why the mother does not believe those men to be the father of her child is also important to be disclosed in the form. If the mother had been married before the child was conceived yet her husband is not who the mother deems the father of her child, he should be able to explain why along with the name of her husband and the details of their marital union. In the third section of the form, the father of the child or the affiant will be the one who will be the one to fill out the fields. The third section contains a set of questions to be answered by the affiant such as whether he was present during the time the child was born and if he and the mother lived together during the period when the child was conceived. The fourth section of the form, on the other hand, will cater to other pieces of information which will be beneficial for the evaluation of the claims in the affidavit. Affidavit of Admission of Paternity Form – In this affidavit of paternity form, the affiant is presented with a format identical to a formal letter addressed to a legal entity. The form contains areas where the affiant will be able to state his name as the father of the child and his complete address. There are six specific data entries to be disclosed by the father as well which are significant for his affidavit claim. The first item to be disclosed in the list is the country where the father or the affiant is located, his passport number, and the date and name of the authorized agent who issued his passport. The second item or pieces of information to be included in the form are the details of the affiant’s relationship with the child’s mother. This is where he will state when he met the mother and whether or not they have had a relationship before. The third item on the form will highlight the date of when the child was known to be conceived by the mother and what name did the affiant and the mother gave to the child legally after it was born. 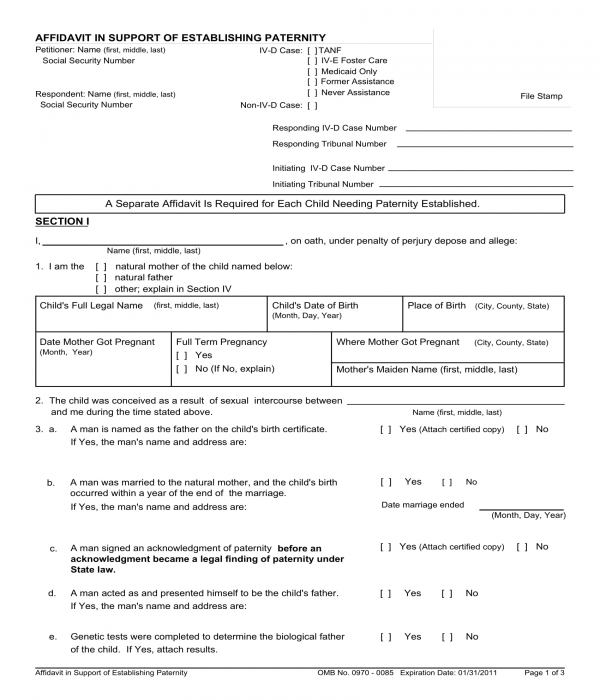 The fourth item on the form is for stating the data of the affiant’s marriage with the mother of the subjected child. The date of their marriage and the laws which are observed for their matrimonial union will be indicated in the form. On the other hand, the fifth item will disclose the legal name of the child whom the affiant is claiming his paternal rights with and the sixth item is for the acknowledgment of the affiant regarding the use of his surname for the child’s name in legal documents from the day of the affidavit’s approval. A legal witness should also sign the form. Most legal witnesses are attorneys or notary public attorneys who are called out by the affiant in order to help him verify his claims and to prove that the information he disclosed in the affidavit form was of true values. And to formally end the affidavit, the affiant must also affix his signature on the form with his full name and date of when he submitted the affidavit to the authority or the court. Affidavit of Paternity Copy Request Form – If a paternity affidavit form has already been submitted to the court or to the authority, then an individual, either the mother or the father or any party related to the child in question must use an affidavit of paternity copy request form in order to obtain a duplicated copy of the submitted affidavit. The pieces of general information to be used by the authority in determining whose affidavit form submission will be sent to the requestor is required to be stated in the form such as the name of the child, the child’s date and place of birth, and the names of the child’s mother and father. A copy of the requestor’s identification cards or other proof of his identification must be enclosed with the request form along with the payment or check that he will be providing to pay for the services and process in obtaining the affidavit copy. The name of the requesting party, his mailing address, and his daytime telephone or contact number are also to be included to complete the request form. Affidavit of Paternity Use of Father’s Surname Form – This is the variety of affidavit form suitable to be used by an individual who wants to claim his paternity relationship to a child as well as allow a child to use his surname. In the form, the name, age, and the residency information of the affiant will be discussed. The succeeding sections will then be intended for the child’s information ranging from the child’s name up to the birth information of the child. A signature and seal of a notary public will be required in order to legalize the affidavit form. 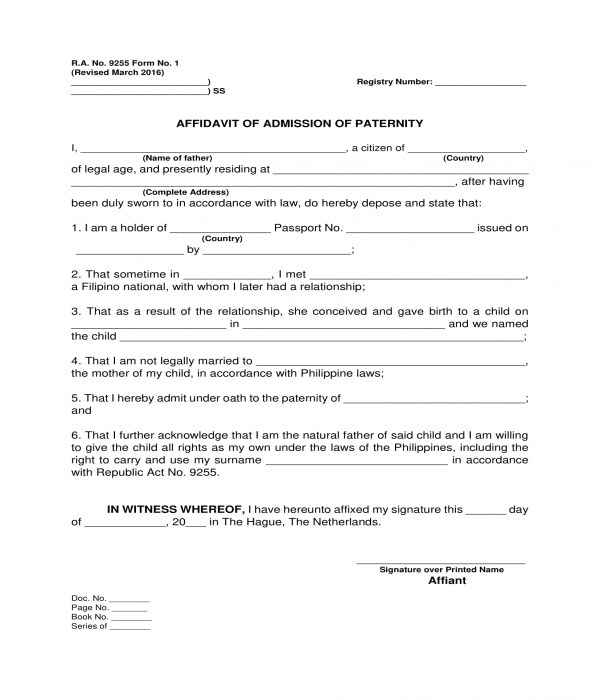 Why an Affidavit of Paternity Form Is Important? An affidavit of paternity form is important due to its role in marking the beginning of a process or procedure in determining the validity and facts from a claim of an affiant or a father claiming his paternity relationship to a child. The affidavit form must be submitted along with other legal forms and documents which can be used to verify the claims of the father or affiant. Some of the known forms which are attached with the affidavit includes signed witness statement forms and even other sworn affidavit forms from people who are related to the child or have known the situation of the affiant prior to the submission of the affidavit.